Weed is quickly becoming legal everywhere as state after state fall in a haze of 420 bliss, but it comes with a heavy cost…weed breath. When you smoke enough weed to make an elephant want to chill and eat Cheetos, you’re going to have bad breath. Have no fear, because Smoked A Pound Of Weed Mints is here. While your friends may enjoy the Mary Jane, they aren’t going to love the chronic halitosis emanating from your mouth. It’s not your fault, but being in a state of total relaxing bliss does have the occasional drawback. Marijuana may or may not be legal where you’re at, but if you’re smoking it, then you need to be prepared. We’re not talking about the cops or your roommates, but your breath. Smoked A Pound of Weed Mints is the best way to battle that post bong breath that could slay a dragon. 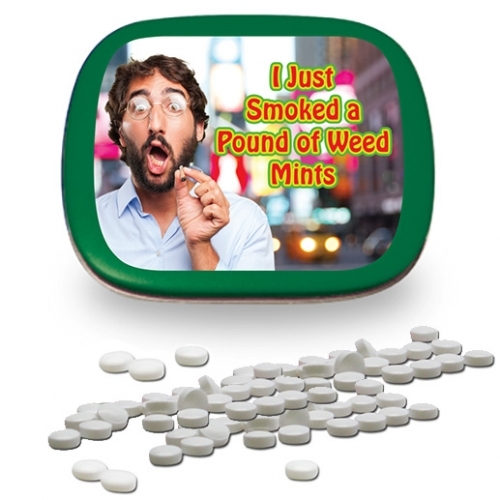 Who would love Smoked A Pound Of Weed Mints? 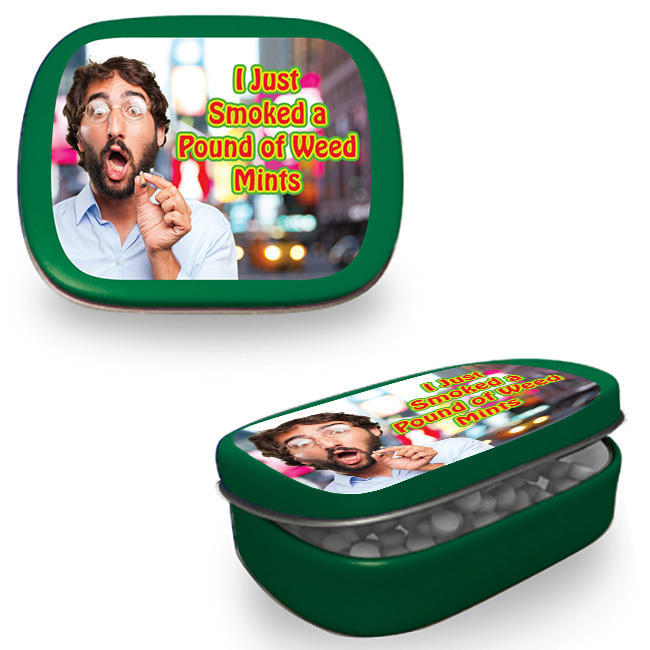 Anyone who thinks Cheech and Chong should be co-presidents and can binge watch the entire Golden Girls series in a single sitting would probably love these mints. If you wax philosophical about the political importance of feather boas, then you’ll love these mints. Basically, these are perfect gift for blissed out buddies who enjoy the great herb. I don’t smoke weed. Can I use these? If you want to be like the cool kids, but don’t want to smoke weed, then carry this around and fool the masses. Odds are they’ll be too mellow to figure it out, and you’ll always have fresh breath. It’s like the best of both worlds, except for the fact you’ll never actually be stoned. Maybe you should take up baking? I smoke a lot of weed…wait….what was I asking? Your guess is as good as ours, however we’re pretty sure the answer is Smoked A Pound Of Weed Mints.